Home Diet & Fitness How Long Will It Take To Burn Off Those Thanksgiving Calories? How Long Will It Take To Burn Off Those Thanksgiving Calories? If you are concerned about what you should/shouldn’t be eating tomorrow on Thanksgiving: Don’t be. Seriously. This holiday is celebrated once a year and if you polish off a plate off goodies in one sitting, it’s absolutely nothing to be guilty about. All you need to keep in mind is that you should get back on track tomorrow. Don’t overdo or underdo anything. There’s no need to work out for 3 hours and eat 500 calories. Eat and workout as you normally would and you will see that the bloated feeling will go away before you know it. In case you were wondering however, a Thanksgiving meal can range from 3,000 to 4,500 calories according to the Calorie Control Center. WOW. That is more than the recommended calories a day for even a fairly active person. Did you know that is also equivalent to eating 7 Big Macs?! It’s hard to imagine eating 7 whole hamburgers in one sitting but with all the high-fat, high-carb foods mixed with sugar-y cocktails, Americans have no problem putting all that down. While it can be enjoyable during the act, the feeling is more than uncomfortable the day after. Hence, the food coma. That’s why many of us will be heading to the gym the day after to work it all off, but “working it off” may be harder than you would expect. CoachUp! 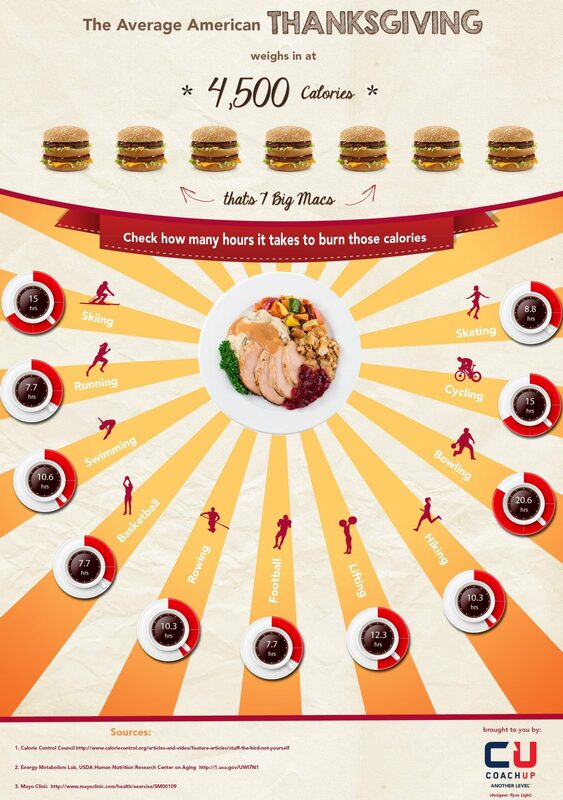 is putting it all into perspective with this infographic showing how long it would take to burn all those calories. It would take 15 hours of skiing, 20+ hours of bowling, or 7+ hours of football to burn it all off. As we mentioned earlier, it’s best to forgo putting your workout routine in overdrive. You’ll find that getting back to normal will be much more bearable and healthier and you’ll be feeling like yourself sooner than you might expect. That being said, this is a pretty cool way to put it into perspective before you reach for thirds! 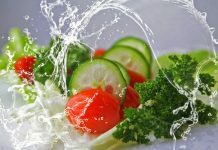 For more on Food & Fitness, check out our features here. How will you work off your Thanksgiving turkey?